It is as if wintertime is definitely excluded from the seasons. Today I take a stroll through our garden just to see what’s going on. December was unusually mild with temperatures up to 15⁰C (59⁰F). It is as if wintertime is definitely excluded from the seasons. Although the temperature drops a few decrees it is relatively warm. 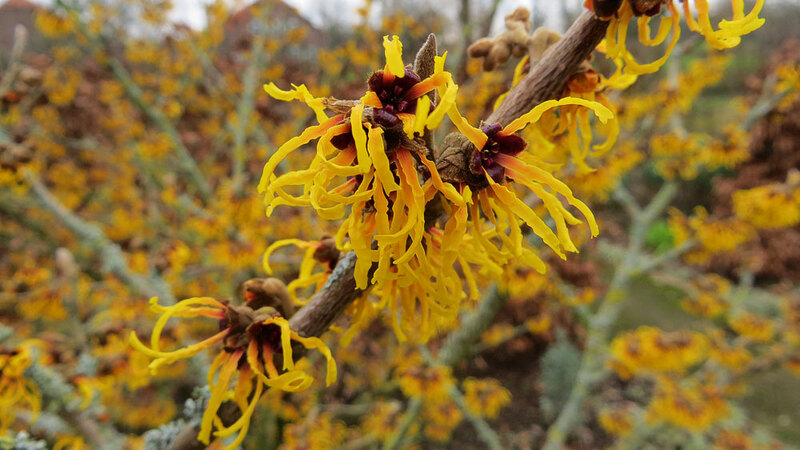 A late climbing ‘Schneewittchen’ rose flowers together with the first flowers of the witch hazel. For me, this shrub is always a sign that spring is reawaking. I suppose it will take only a few weeks before the tiny yellow paper like petals paints this shrub in a riot of colour. The winter jasmine near the garage started to flower at the end of November and the fact that we had hardly any frost makes sure that it is continuing to flower. Its lemon yellow flowers are dancing above the lawn. It is a sunny but windy Sunday afternoon and I am walking in the direction of the American Garden. The sun is casting long shadows on the rich radiant purple flowers of the heather. Crows are screaming but sometimes a blackbird joins into an almost vernally song. I turn right to see what the long border has to offer. 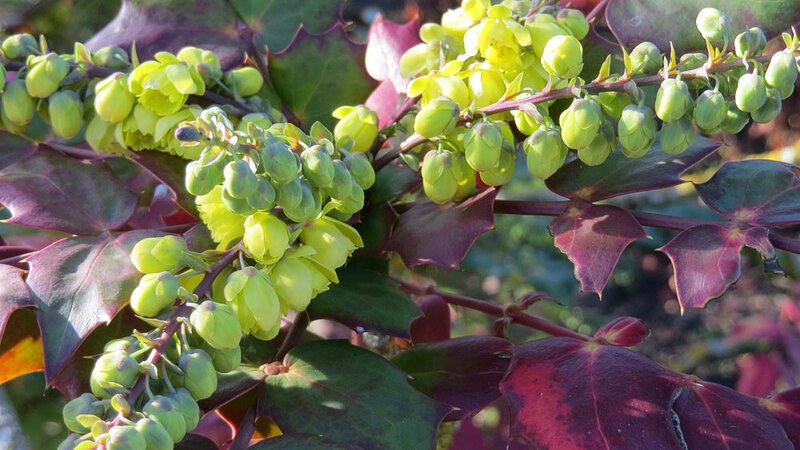 Only a few flower buds of the Oregon grape (Mahonia aquifolium) are open and you have to come very close to get whiff of its enchanting scent. 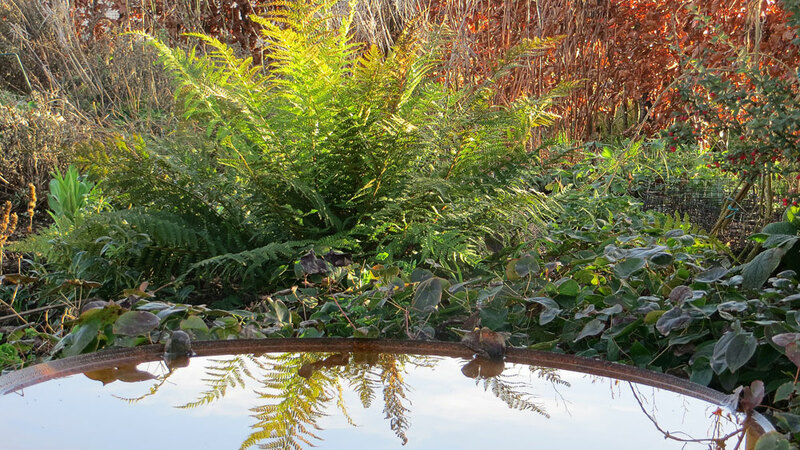 Somewhat further away a fern reflects it fronds in the water. 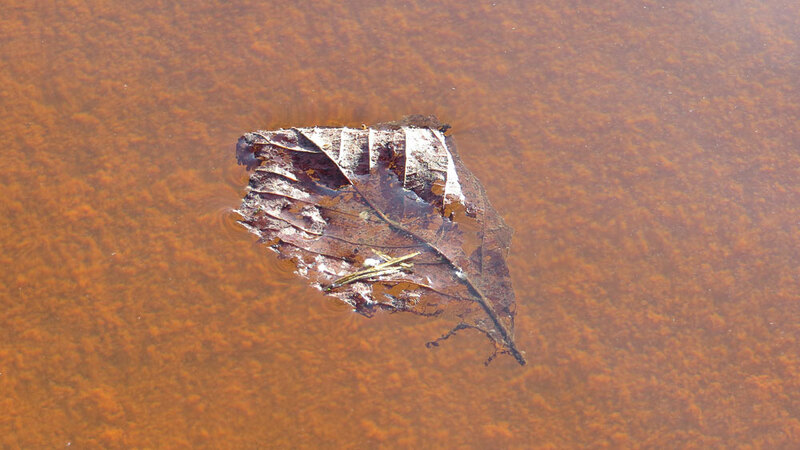 An autumn leave floats on the water. Meanwhile, a horse carriage is passing by. 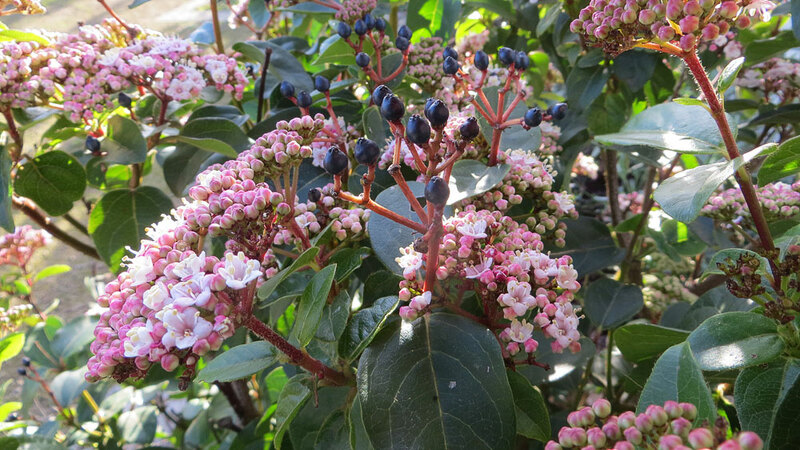 For me this shrub is always a sign that spring is reawaking. I approach the front door of our house. On the left and right side, the Laurustinus present their rosy white blossoms and there are even some blue fruits to admire from last year. 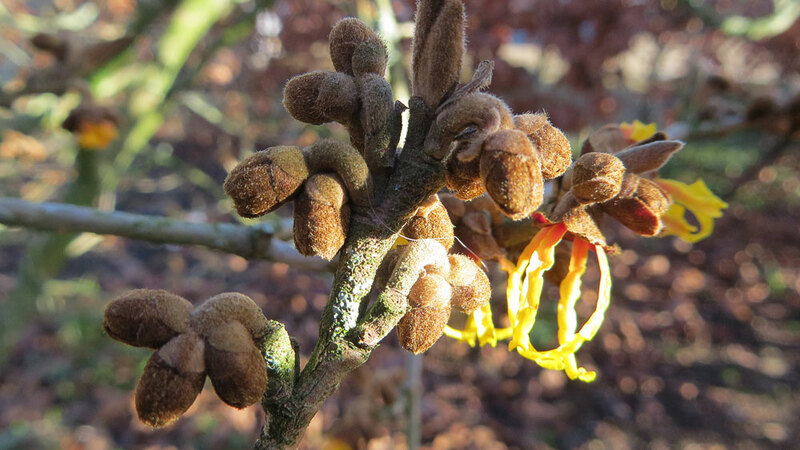 Not all the flower buds are open but we have to wait untill spring before they spread their tantalizing scent. The sun sets down above the red-tiled roof of my neighbour. I enter the house to make some tea.